The comfort of carpet is unmistakable, as is the warmth it can add to a room or a splash of color to any space. ProSource® of Newport News is your source for a vast variety of carpet choices at low, wholesale prices that can fit any budget. Whatever the desire — from stately, traditional looks to modern design styles, you’ll discover something to appeal to any project preference. Fibers include nylon, olefin, polyester, and wool, and the range of colors is extensive. Advancements in technology have broadened the appeal of carpet, enhancing its durability and range of protection against spills and stains. Whether wall-to-wall or having it bound into a custom area rug to fit any space, carpet is stylish choice. Pre-made rugs are a nice selection in the home, but these designer-inspired pieces are limited in the number of size and style available. Expand the boundaries by selecting any carpet and having it bound into a custom area rug. The desired color, design and, most important, size are all available. The possibilities are immense. Capture the preferred look of a space, then select any carpet from the wealth of choices and have it fashioned into a custom area rug. The term “berber” originated in North Africa by the Berber tribes. It’s a type of loop carpet that’s constructed with thick yarns having randomly-spaced flecks of color against a base color backdrop. Berber is a known as a durable carpet. Plus, its nubby weave helps hide dirt and vacuum marks. As a result, its often found in areas prone to heavy traffic. This carpet is sometimes referred to as “California shag” because it carries some of the same characteristics. 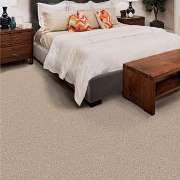 Frieze carpet can be a popular choice because it carries a comfortable feel. It has long, tightly twisted fibers that present a “curly” textured surface. Because of this, it minimizes the marks often left by footprints and vacuums. 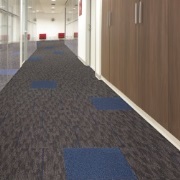 This carpet has a uniform look about it, brought about because the loops are the same height. For a different look, opt for a multi-level loop, which tends to have two to three different loop heights. This creates a pattern effect, but it also serves up durability mixed with a more casual look. Finally, there’s cut-loop pile, also known as cut and loop pile. 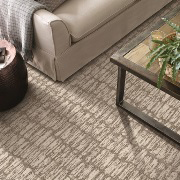 This carpet blends cut and looped yarns for a variety of surface textures such as sculptured effects of squares, chevrons, and swirls. Plush is perhaps best known for its comfortable texture and luxurious touch. Sometimes it’s referred to as velvet or velour carpet. Plush offers a smooth and dense weave, which distinguishes it from other carpet types. The pile is short and slightly twisted. 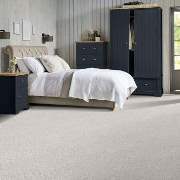 While comfort underfoot is a plus, plush carpet typically shows tracking from feet and vacuuming, so rooms of lower traffic are best suited for it. 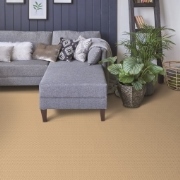 With its uneven fiber lengths, texture carpet has a fuller, more textured surface. The flooring gives off a touch of character in the space as a result. Texture carpet gained its popularity from the way it’s made. 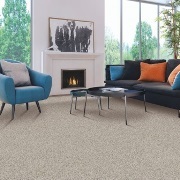 By combining the cut pile process with uneven and/or twisted fibers, it’s a durable carpet that does an admirable job of hiding dirt, dents and tracks. Patterned carpet can be profound in its appearance, or the pattern can be subtle yet still present. A complex pattern can mix designs and colors for an eye-grabbing statement. Meanwhile, tone-on-tone patterns offer an understated, yet distinct flooring look. It can have its own personality or mesh beautifully with the entire room’s persona. From regal views to modern styles, patterned carpet can impress in any space. For rooms both large and small, a single color can act as an accent to the surrounding décor or act as a focal point. That makes solid colored carpet a great choice. One style of carpet can offer numerous color shades ranging from light to dark. Stay conservative with an earth tone color such as brown or dare to be bold with red hue, or whatever our project’s color wheel may desire. When it comes to the desired look, look to solid colored carpet. It’s true, carpet can be waterproof, preventing liquid spills from seeping through to the floor underneath. The H2O technology in carpet products provides a special backing with a moisture barrier. This means liquids remain above the backing, making them easier to deal with and preserving the floor the carpet covers. A multitude of styles and colors are available, ensuring a stylish choice can be made. For young ones in the home, a comfortable carpet is a common choice, especially for small children that tend tumble. Kid friendly carpet, however, needs offer more than softness if its going to withstand the life of tikes, toddlers and teens. It needs to be durable and provide protection against possible spills and stains. Today’s kid friendly carpet doesn’t disappoint, as its designed to live up to the life of kids in the home. When a home is occupied by furry friends, the carpet faces claws, play time, nap time and, sometimes, a bit of mischief. Pet friendly carpet means it can hold up against all of these. A lot of advancements in technology have enabled carpet to survive animal life inside the home. 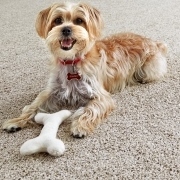 Pet friendly carpet dons a myriad of defenses, from stain protection to odor resistance and many more, ensuring the flooring is enjoyed by the home’s furry friends. 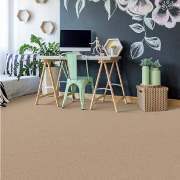 Carpet at a business can make a big statement, whether the space is large or small, but the demands it faces a little different than the home. That’s why there’s carpet made specifically for commercial environments. It’s performance is designed for heavier traffic, as well as heavier equipment and furniture. Commercial carpet also serves up numerous styles and designs to match the personality of the business it represents. We proudly service Newport News, Williamsburg, Hampton, Smithfield, and Yorktown, Virginia. The ProSource of Newport News showroom is conveniently located in Yorktown, Virginia and serves all of the neighboring cities including Achilles, Ark, Bena, Bohannon, Cardinal, Christchurch, Cobbs Creek, Deltaville, Diggs, Dutton, Fort Eustis, Fort Monroe, Foster, Gloucester, Gloucester Point, Grimstead, Gwynn, Hallieford, Hampton, Hardyville, Hartfield, Hayes, Hudgins, Lackey, Locust Hill, Maryus, Mathews, Moon, New Point, Newport News, North, Onemo, Ordinary, Poquoson, Port Haywood, Saluda, Schley, Seaford, Severn, Susan, Topping, Wake, Ware Neck, White Marsh, Wicomico, Williamsburg, Woods Cross Roads and Yorktown.